The annual meeting this year, was held on Friday, January 17, 2014, at 7pm, in the Village Hall, with special guest speaker Carey Lundin, director and co-producer of “Jens Jensen The Living Green”, a feature documentary for PBS about the irascible Prairie Style landscape architect and the Midwest’s first great conservationist. Jensen was profoundly influenced by Olmsted. 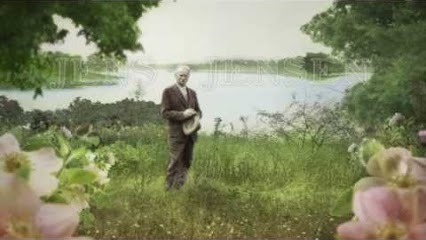 Carey touched upon the many Olmsted connections with a film excerpt covering the Columbian Exposition Wooded Island, Riverside, the small parks (the sons of Olmsted) and Central Park. The production of the film and location of long lost interviews of Jensen reads like a detective novel. This was a rare glimpse of Jensen in the first person and the opportunity for the documentarians to describe how they brought it together. As is tradition, a scrumptious buffet followed the meeting. We thank all who attended! “Jensen’s voice is so clear and strong in this film that when I heard him speak for the first time, he reached out and grabbed me with his story. I had never heard of a landscape having a democratic ideal. I had no idea that the landscapes Jensen created for the workers of Chicago (he was one) were designed to be a clearing in the concrete jungle for the families who breathed heavily polluted air and lived in destitute squalor. I didn’t know that children worked 12 hours a day and play consisted of catching rats. The community gardens he designed into all of his schools, hospitals and some park landscapes were delivering fresh food where there was none, and in many cases, still isn’t any. And although I spent summers at the Indiana Dunes I didn’t know that the entire shoreline might have been one giant steel mill if he hadn’t held the largest outdoor gathering in American history up to that time to create a conservation fervor stopping the mills from expanding. So heady was that battle that it took decades to later create the Indiana Dunes National Lakeshore.